Status: Fairly common regular resident east, rare casual elsewhere. Documentation: Specimen: UNSM ZM7741, 28 Nov 1937 Fontenelle Forest, Sarpy Co.
Taxonomy: Four weakly-defined subspecies are recognized by some authors (Pyle 1997, Mazur and James 2000, Clements 2016), but the species is also treated as monotypic (Gill and Donsker 2017). If subspecies are recognized, there are two in Texas and the southern US (helveola, georgica), one in Mexico (sartorii), and one in the US north of the ranges of southern helveola and georgica (varia). Nebraska birds are varia. Changes Since 2000: This species is expanding its range westward as woods along riparian corridors mature, most notably in the southeast and Republican River Valley. In the lower Niobrara River drainage its status is poorly defined. It has been reported from and near Bohemia Prairie WMA, Knox Co since 1985 (Schreier 1986) and it has been present in the Verdigre area, including Grove Lake WMA, Antelope Co since 1962-63 (Svoboda 1963). Mossman and Brogie (1983), despite careful searching, could not find this species in the Niobrara Valley Preserve in 1982, although Youngworth (1955) had noted it there earlier. There are no reports between Knox Co and Cherry Co other than a report without details 5 Sep 2014 (eBird.org, accessed April 2018), although one was reported from Brown Co 17 Sep 1997, one was giving the classic “who cooks for you” call at the Valentine City Park, Cherry Co 17 May 2015, and one was reported there 24 Jul 2011, almost 200 miles west of Knox Co. It is not known whether these westerly reports, none of which are accompanied by tangible evidence, are wandering individuals or represent an actual range expansion, although the latter explanation is plausible. In the Elkhorn River drainage, it has been reported as far northwest as O’Neill, Holt Co, where there is an undocumented report at a ranch about 10 miles southwest of O’Neill 5 Sep 2014. One was near Oakdale, Antelope Co 4 Mar 2016, and there are several reports from Madison and Stanton Cos, the western extent of regular occurrence in the Elkhorn River drainage. Barred Owls are scarce in the Loup River drainage; westernmost are one seen by a hunter in Boone Co in the mid-1980s, one along Cedar Creek in Greeley Co 13 Jun 2017, one along Turkey Creek in eastern Sherman Co 6 Jun, a road-killed bird in Nance Co 26 Nov 1982, one at George Syas WMA, southwest Platte Co 10 Apr 2010, and one near Dannebrog, Howard Co 1 Mar 2015. In the Platte River Valley west of Platte Co, it is surprisingly scarce, with contiguous reports west only to Merrick and Polk Cos; it has been observed “the last couple of years” 10 miles east of Palmer, Merrick Co, and was found in Polk Co bluffs woodland near Duncan. There are three reports from Hall Co, 2 Jun 1991 (Lingle 1994), 14 Mar 2018, and several heard 2005-2006 (Daniel Kim, personal communication). These Hall Co records may result from northwesterly spread in tributaries of the Big Blue River drainage such as Turkey Creek, rather than westward along the Platte River Valley. In Lancaster Co it was noted to have established residency in Wilderness Park in the Salt Creek drainage in the early 1970s, after the area became a park and hunting was disallowed; it was reported there 21 Dec 1975 (Cortelyou 1976). The furthest west report in this drainage was from Butler Co, where it was reported at Redtail WMA 30 Apr 2003. It apparently occurs only in low numbers in the Big Blue River drainage; reports on the main stem Big Blue are northwest to Seward Co, where it is “seen and heard year-round along the Big Blue River” near Seward and confirmed as breeding in Seward Co in the period 1984-89 (Mollhoff 2001). Further northwest, one was at Buckley Park, Stromsburg, Polk Co 4 May 2018. Furthest west reports in the Big Blue River drainage are from westerly tributaries. Singles were found on Swan Creek, Saline Co 28 Mar 2013 and 4 May 2016, one was “east of Crete” in 2004 and another in Saline Co 13 Feb 2013. Another westerly tributary, Turkey Creek, has hosted singles as far west as southeast Fillmore Co, where it was reported 11 Mar 2006, at Geneva Cemetery 12 May 2013, and at Lone Star RA 15 Feb 2018. There are several reports from the Little Blue River drainage, most in Jefferson Co, where it was first reported as early as 10 May 1950 and seen next in the Fairbury City Park 9 May 1983 (Hoge and Hoge 1984); there have been reports since from Flathead WMA 3 May 2014 and 4 Mar 2016, Rock Creek Station SHP 18 Feb 2007 and 2 May 2016, Rock Glen WMA 7 May 2012, and Steele City 6 Mar 2013. Northwest of Fairbury there are few reports, although it has been reported as far north and west on Little Blue River tributaries as Clay and Adams Cos; one was picked up by Raptor Recovery in Adams Co 10 Mar 2008, another was reported 4 Feb 1974 in Adams Co, and one was at Deweese, Clay Co 11 Aug 2013. West and south from Fairbury in Little Blue River tributaries, there are reports along Rose Creek, Jefferson Co 29 Mar 2013 and 20 Apr-11 May 2016, and, in eastern Thayer Co, near Hubbell 23 Mar 2015, near Hebron 11 Jul 2013, at Little Blue WMA 25 Apr 2016, a road-killed bird near Gilead 3 Jan 2004, and one at Meridian WMA 29 May 2016. The species appears to be established at the eastern end of the Republican River Valley, most notably in Nuckolls Co; one was flushed from an apparent nest site 20 Apr 2014. There have been a few reports west of Nuckolls Co since 2012, suggesting recent gradual movement westward. One was at Narrows WMA, Webster Co 14 May 2014, one was photographed near Inavale, Webster Co 16 Jun 2017, one was near Riverton, southeastern Franklin Co 21 Feb 2012, and one at Bloomington, southwestern Franklin Co, 23 Mar 2015. Despite unsuccessful efforts to detect this species in Harlan County in multiple years during the local CBC, finally on 15 Dec 2016, a single bird was flushed southwest of Alma; another was located on the same CBC near Orleans 14 Dec 2017. A major westward move was indicated by the two calling at Medicine Creek Reservoir, Frontier Co 5 May 2018 and two were at Oxford, Furnas Co 17 Feb 2019 (eBird.org). There is accumulating evidence that Barred Owls occur on occasion and may be resident in low numbers west to Lincoln Co; older reports include Tout’s (1947) listing of Barred Owl as a “rare straggler” in Lincoln Co, citing two reports, one doubtful and the other of a bird killed by a train 1 May 1927 near North Platte, and one was “chased out of cottonwoods” near Lexington, Dawson Co, 3 Oct 1962 (Kinch 1963). There are two reports 30-31 Dec 2011 in Dawson and Keith Cos without details (eBird.org, accessed April 2018). More recently, one was reported without details in Dawson Co 1 May 2016, and there are three recent reports of birds found dead in North Platte, Lincoln Co parking lots: 18 Nov 2006, 7 Jun 2007, and 4 Dec 2015; it was suspected that these birds might have been hit by large trucks in eastern Nebraska and carried to North Platte on Interstate Highway 80 (T.J. Walker, personal communication), although photographs of one in a North Platte yard 17 Apr 2018 (eBird.org) and another in the North Platte River Valley between North Platte and Brady 10 Oct 2018 (eBird.org) are suggestive of an establishing westerly population there. West of these locations, there are a few scattered reports. Most intriguing are old reports cited by Rosche (1982): it was “heard every night” 18 May-1 Jun 1900 in Monroe Canyon (Crawford 1901) and reported in southern Dawes Co 21 May 1965 without details. A large owl seen briefly in Dawes Co 17 Feb 2017 may have been this species. Barred Owl once occurred in very low numbers in the Black Hills of South Dakota (Peterson 1990; Tallman et al 2002), but recent surveys since 2002 have failed to locate any (Jeffrey Palmer, personal communication October 2017). The only Colorado record was of a nesting pair in 1897 at Holyoke, in extreme northeast Colorado; this record was considered acceptable by Livezey (2009). Bent (1938) noted that northerly breeders may move southward in severe winters; one banded May 1998 as a fledgling in Nova Scotia was recovered Jan 1999 near Hamilton, Ontario, some 1600 km (995 miles) from the banding site (Don MacLaughlin, post to BIRDCHAT, 7 May 2000). It is possible such long-distance movements from the breeding range in southern Canada or possibly from the Black Hills in southwestern South Dakota might account for occurrences in central and western Nebraska. 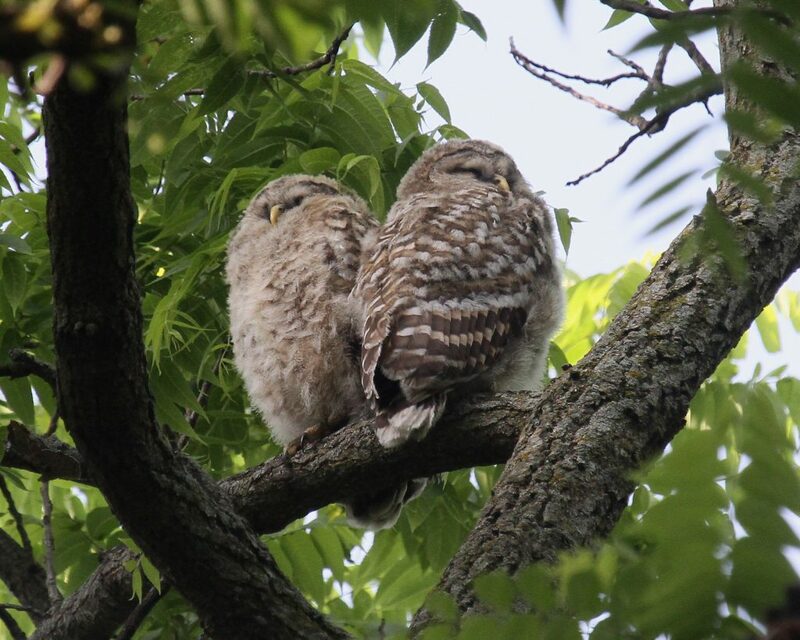 Recently-fledged Barred Owls at Walnut Grove Park, Douglas Co 17 May 2010. Photo by Phil Swanson. Cortelyou, R.G. 1976. 1975 Christmas Count. NBR 44: 3-8. Crawford, J.C., Jr. 1901. Results of a collecting trip to Sioux County. Proc. NOU 2: 76-79. Hoge, G.L., and W. Hoge. 1984. Southeast Nebraska. NBR 52: 22. Kinch, C. 1963. Notes from Lexington. NBR 31: 12-13. Livezey, K.B. 2009. Range expansion of Barred Owls, Part I: chronology and distribution. American Midland Naturalist 161: 49-56. Schreier, L. Barred Owl in Knox County. NBR 54: 24-25. Shupe, S. 1985. Observations of the Barred Owl in southeastern Nebraska. NBR 53: 37-38. Svoboda, W.J. 1963. Excerpts from letters. NBR 31: 15.